Two men, back to back, imply seperation and disagreement. Ideas represented through images are my passion in photography. After 40 years in the art form, a pretty picture holds little interest for me, they can be found by the millions on the web. My approach inclines toward commentary and concept, even in the face of a populace seemingly indifferent to such notions. This image dabbles with the number two, two figures back to back with no common point of view. Two identical shadows cast from nearly identical creatures. 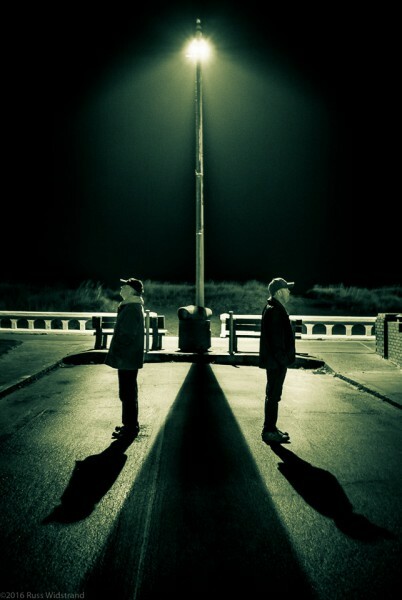 Diving further into the image, the light pole and its shadow acts as a symmetrical divider, further separating the two figures. Ironically, it is that light that illuminates the men, creating their darker shadowed-selves… they cannot see the commonality of its source. So while in the midst of their opposition, this singular light shines equally on both, a potential metaphor to lead them toward unity. I liken the image to our two party system and the seemingly insurmountable differences that appear to divide our society, politics and country. These differences will again be put to the test through our democratic system in the upcoming presidential election, though I hope we are not heading into more unbridled polarity, bombastic politicians and a populace at odds.